Teletalk 3G Internet Package can be activated through SMS. Choose desire package and type given code and send to 111. How to activate Teletalk Internet Package ? To activate desired Teletalk Internet package from Category list, customer need to type dial short code and send sms to 111. 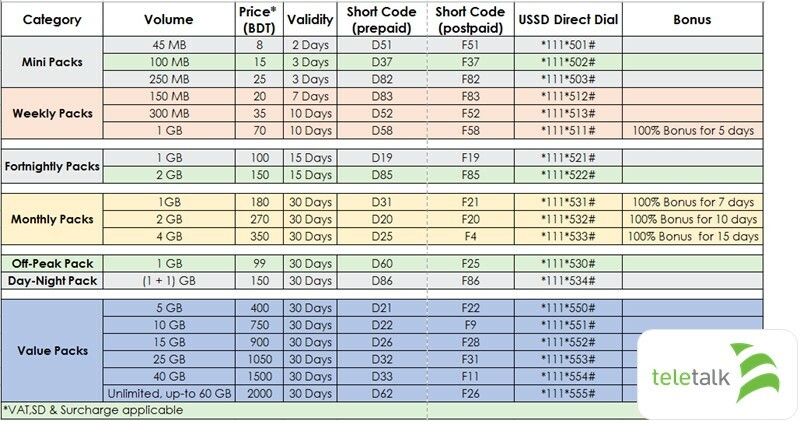 For Prepaid customer, type: d31 and send to 111 . For Postpaid customer, type: f21 and send to 111. How to check Teletalk Internet balance ? Please note that, Unused Internet data will be carried forward if same Internet package is activated before expiration of existing Internet pack (bonus data won't be carried forward). For more details, visit Teletalk Website.